BARRETT, Frank Aloysius, a Representative and a Senator from Wyoming; born in Omaha, Douglas County, Nebr., November 10, 1892; attended the public schools; graduated from Creighton University, Omaha, Nebr., in 1913 and from its law department in 1916; during the First World War served as a sergeant in the Balloon Corps, United States Army 1917-1919; admitted to the bar in 1919 and commenced practice in Lusk, Wyo. ; also a rancher; county attorney of Niobrara County, Wyo. 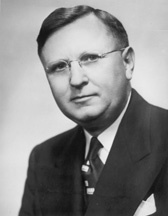 1923-1932; member, State senate 1933-1935; member of the board of trustees of the University of Wyoming; elected as a Republican to the Seventy-eighth and to the three succeeding Congresses and served from January 3, 1943, until his resignation December 31, 1950, having been elected Governor of Wyoming; served as Governor from January 1951 until his resignation January 2, 1953, having been elected a Senator; elected as a Republican to the United States Senate and served from January 3, 1953, to January 3, 1959; unsuccessful candidate for reelection in 1958; general counsel, Department of Agriculture, Washington, D.C., and member of board of directors of Commodity Credit Corporation 1959-1960; unsuccessful candidate for the Republican nomination for United States Senate 1960; died in Cheyenne, Wyo., May 30, 1962; interment in Lusk Cemetery, Lusk, Wyo.